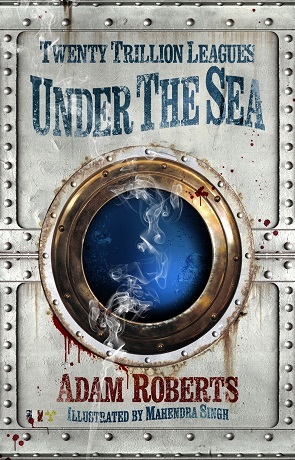 As the name would suggest, Twenty Trillion Leagues Under the Sea takes on the classic Jules Verne 19th century novel Twenty Thousand Leagues Under the Sea as inspiration to create a remarkably clever and entertaining novel that is in parts as thought provoking as the original must have been when it was first written. The year is 1955 and the French Navy have built a nuclear powered replica of the Nautilus - the Plongeur, built from Nemo's blueprints recovered from India and partly funded by a reclusive Swiss millionaire. It is launched in secrecy and crewed by sailors and scientists, commanded by a short tempered Captain Mason. Almost as soon as the submarine begins it's descent and seemingly having passed the Continental Shelf it begins plummeting toward the ocean floor except the ocean floor isn't there to meet the sub and the descent continues past the 5000m depth that is supposed to signify the very bottom of the ocean. They continue to drop deeper and deeper in waters unknown, at first without serious incident - before long panic sets in. Each of Adam Roberts books I read introduce me to another facet to his talents as an author, no two books are alike and this includes the style of the writing. It's an incredible talent and here his voice manages to capture Verne's vernacular while still maintaining his own unique style. The story itself is a great tribute to the original, managing to be respectful, playfully critical and also a parody in places. This feeling is re-enforced by the remarkable illustrations penned by Mahendra Singh, full page sized monochrome pieces of artwork that appear to have been created by woodcut blocks and as such have a wonderfully old fashioned feel about them. This re-enforces the feeling that you are reading a tribute to the 19th century classic. Incidentally the name "Plongeur" means "diver" in French but it's also the name of the very first submarine in the world (built by the French in 1863) to be propelled by mechanical power. The story that Roberts creates manages to be more mind bending and imaginative than Verne's novel must have been 150 (ish) years ago. There is a lot to like with this book, we've got a wonderfully rich mix of characters within the crew which the author makes excellent use of to create a drama based on hidden agendas, suspicion and just plain awkwardness and pig-headedness - a great example of how not to cope under pressure and in close confinement. As mentioned above there is also a very imaginative use of setting and plot devices which manage to come across as almost fantastic in nature rather than science fiction - very much like Verne's own imaginings. Twenty Trillion Leagues Under the Sea combines the authors serious novels with his parodies. The result is something that is not only quite different and British in style but utterly compelling from the beginning to the end. Written on 3rd March 2014 by Ant.